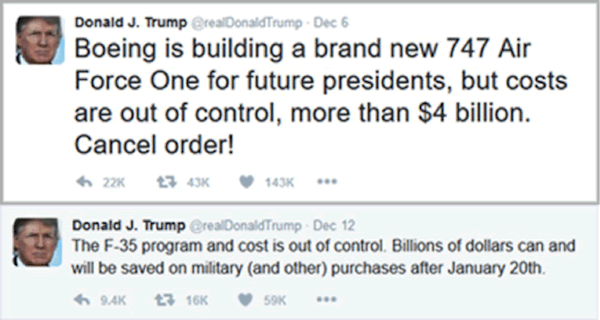 BY PATRICK WATSON : This month, President-elect Trump annoyed some people when he criticized two top defense contractors on Twitter. Wall Street isn’t used to presidents publicly criticizing major US companies. The tweets caused shares to tumble a few points for both Boeing (BA) and Lockheed Martin (LMT), which makes the F-35 fighter planes. The stocks recovered quickly, but the sudden moves gave traders a few frantic minutes. 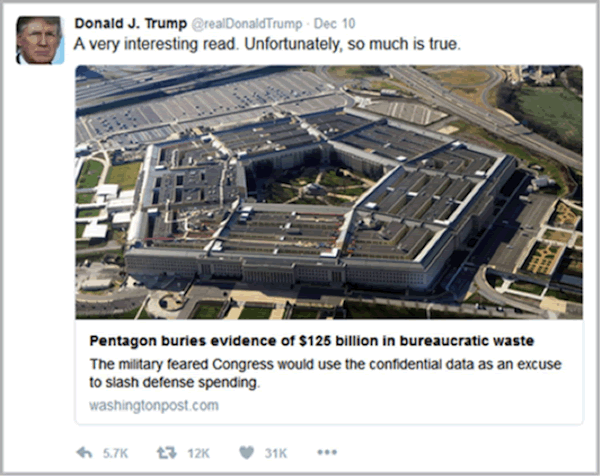 Within the same week, Trump also shared a Washington Post article about a study that exposed enormous bureaucratic waste at the Pentagon. So, the plan was killed. The Pentagon imposed secrecy restrictions on the data making up the study, which ensured no one could replicate the findings. A 77-page summary report that had been made public was removed from a Pentagon website. This doesn’t surprise me in the least. A few months ago, I told our Macro Growth & Income Alert subscribers how, as a lieutenant, I had dozens of expensive vehicles forced on me. I had no troops to drive them and no place to park them. It didn’t matter. Someone up the chain had orders to spend millions of dollars on those vehicles and send them my way, so that’s what he did. Every military officer has similar stories, so Trump is absolutely right about Pentagon waste. I’m convinced it costs lives too: Other units had to make do without urgently needed resources while I was getting Humvees jammed down my throat. Such things don’t happen in the private sector (at least not as often) because corporations must show a profit. The Pentagon doesn’t… nor should it. When you think about it, all defense spending is economically irrational. Governments spend billions preparing for wars they hope to never fight. It’s kind of a very expensive insurance—we have to defend the nation from potential enemies, whatever it costs. That simple fact gives military spending a natural upward bias. Combine that bias with bureaucratic inefficiency and the cleverness of defense contractors, and the result is… well, what we have. That F-35 program, for instance, is directly responsible for thousands of jobs in virtually every congressional district. The contractors arranged it that way on purpose. Canceling the F-35s might be the right move, budget-wise, but it would have serious political side effects. President Eisenhower was way ahead of his time when he warned about the “military-industrial complex.” He knew from experience how political forces could make defense spending spin out of control. It is truly insane and no one has been able to change it. Will Trump have better luck? Maybe, though choosing retired USMC General James Mattis as secretary of defense doesn’t give me confidence. Mattis barely had his uniform off when he took a high-paying board seat with leading defense contractor General Dynamics (GD) in 2013. But I could be wrong; some people say Mattis was a good general. Maybe he learned something from that private-sector experience that will help him rein in the contracting beast. I hope so—but I’m not going to bet on it. No, the far better bet is that defense spending will remain strong and probably grow after Mattis and Trump take command. They may change priorities, but I can’t see them spending any less. That being the case, I think it is a mistake to interpret those Trump tweets as a sign that defense spending is on a downhill slide. In fact, the opposite is much more likely. It’s true that the US has the world’s largest defense budget, but other countries spend a lot too… and they will have to spend even more if Trump gets the US’s NATO allies to shoulder more of the financial burden. I also bet Trump will not-so-subtly suggest they buy American products, which will offset any revenue loss from lower Pentagon spending. I’ve been bullish on defense for a long time. It is the closest I’ve found to an all-weather sector, and I believe it will stay that way. Global peace and harmony aren’t on the horizon yet. On the other hand, we don’t have an ideal world (and probably never will). So, when reality hands you a lemon, there’s nothing wrong with making lemonade. Now is your chance. Now, for a limited time, you can download this free report from Mauldin Economics detailing the rocky roads that lie ahead for three globally important countries in 2017—and how the economic fallout from their coming crises could affect you. Top 3 Economic Surprises for 2017 is required reading for investors and concerned citizens alike. Get your free copy now.